When it comes to living life large, it’s easy to do in Ibiza. However, if you want to feel like royalty without dishing out cash for the crown, follow Together Travel’s Top 10 Money Saving Tips when it comes to partying on the White Island. Of course if you are not going to Ibiza, most of these tips can be applied to your holiday destination. A quick look on Tripadvisor will help with tips from previous holiday makers. To party or not to party… Is that even a question? Let’s face it, while you may look like Kim and Kanye you are not, nor do you have a wallet the same size. To avoid scrambling for change outside Ibiza’s notoriously costly venues, follow our tips on how to cut corners and save when gaining entry to the islands most legendary clubs. Purchase a package. If you’ve already made the decision of purchasing Together Week Ibiza Package, then fear not, with entry to Pacha, Amnesia and Sankeys sorted, plus a trip to Ocean Beach and Pearl Club later on you’ll be king of the party! But, for all those plebs out there, when considering the cost of clubbing in Ibiza an average night’s entry can range from €40 for your stalwart house and techno nights, to up to €60, or even €80, if you want to see the ‘superstar’ DJs like Guetta. Benefit immensely by booking Together Ibiza Ticket Packs and saving up to 70% when you buy entry to three or more clubs. Even your mum loves a deal. Adding on Ad-ons. If three trips to superclubs, poolside raging, and a sunset night on a yacht are still not enough for you, then we suggest buying ad-ons. When adding extra clubs or events to your itinerary, Together is happy to provide you with a discounted price of £15-£35 depending on the night and club you choose. But, book in advance, tickets go fast! Affording to get inside a club is only the first hurdle over the money barrier, its keeping yourself fuelled on a reasonable budget of booze that’s the second, and often the most difficult, step. The smartest option: drink at home. Fancy paying €15-€25 for a single vodka and mixer or €10-€12 for a mere bottle of water? We thought not. 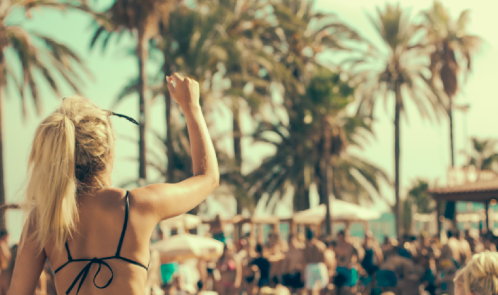 While not every venue in Ibiza will charge your soul for a drink, clubs like Space, Ushuaia, Amnesia, and DC-10 are on the upside, and with a litre of Spanish vodka costing around €10, pre-drinking is a no brainer. On nights out, drink like a local. Would you go drinking in central Soho or the West End? Neither would a true Ibizan. To avoid the overpriced, overcrowded tourist bars head, well, West to San Antonio for some excellent evening pre-drinks on the Sunset Strip. With an expensive sounding name, but inexpensive price tag, you’re in for a surprise as it’s possible to find bars offering a pint or bottle of beer for €2, and a spirit and mixer for €3. Mediterranean cuisine calling your name, but can’t afford to fork out the dough on an expensive five star Ibizan meal? Don’t worry, we’ve got you covered. Still enjoy the delights of Spanish food on a budget and no, that doesn’t mean eating a 4am burger on the beach from the local Mac D’s. Check if breakfasts included. No matter your state, you’re bound to be hungry and hungover the next morning in Ibiza. Far from a local fry up, save money and fuel yourself with a lush, fresh breakfast by booking a package that includes the first meal of the day with your stay. An example is at Hotel Tropical during Together Week Ibiza, breakfast is included every day and better yet, you can eat it poolside! Steal those meal deals. No this isn’t Tesco, but Ibiza does have some fantastic restaurants that offer an extensive array of local cuisine for a very affordable price. Our favourite: David’s, a family-run Italian restaurant in San Antonio where you can get five courses for £12! Make it yourself. Best of all cook! Even if you’re not the most discerning of foodies one of your flatmates is bound to be, and with self-catering apartments and villas you can test out food from Ibiza’s vibrant markets. While saving money is an option, compromising your safety is not, so yes, that bumps hitchhiking off the list. However, there’s no need to despair as we’ve your new best friend: the bus. Bus it. Buses, easy to hop on, easy to hope off. Running, nearly all night and all day. In Ibiza Network buses run from 6:30am until 12:30am and will take you just about anywhere on the island. Bus it in style. Not as glamourous as they sound, Disco Buses do not come equipped with mini disco balls and psychedelic DJs. However, they do come equipped with an insanely low price tag of €3 per ride, function when regular buses are not running, and can be taken straight from San Antonio to Ushuaia. Renting a car. Staying in tune with planning ahead, rental cars can be booked prior to arrival via TravelSupermarket.com and cost as little as £10.91 a day! Split between four friends this is practically nothing, although you will have to pay for fuel and make sure you have a safe and responsible driver when on the island. Make sure you book ahead as airport rental companies can be a rip off.